However, theatrics do not necessarily equal real results. It is hard to deny that the US-Korean diplotainment has led to a considerable relaxation of tension between the parties involved, who seemed to totter on the brink of war just a few months ago. North Korea has declared – and continues to observe – a moratorium on nuclear and missile tests, the nuclear test site at Punggye-ri has been dismantled, US citizens have returned home from North Korean prisons, and Washington has somewhat curtailed its military activities in the Korean Peninsula. But the most important thing is the beginning of a direct dialogue between the main antagonists: the Koreas held two summits within a month and the historic meeting between the North Korean leader and the US president is likely to take place soon. Although the Kim-Trump summit scheduled for June 12 in Singapore seems to have been officially cancelled, there are good chances it will happen after all. At any rate, the parties’ basic motivation has not changed, so there is mutual interest in a successful dialogue. Kim’s priority is to achieve an easing of the crippling economic sanctions and to enhance his international legitimacy with a meeting on “equal terms” with the leader of the world’s sole superpower. Trump is seeking to remove the threat to US national security that derives from the fact that North Korea has come close to acquiring nuclear-tipped ballistic missiles. Besides, solving a monumental international problem that proved too hard a nut to crack for all of his predecessors can seriously bolster Trump’s political standing at home and even help him win re-election. But the parties’ substantive positions on the core nuclear problem remain incompatible. The US insists on “complete, verifiable, and irreversible denuclearization.” It wants North Korea to get rid of nuclear weapons and related production capacities as soon as possible – within one or two years at the most – and at any rate not later than 2020, when the next presidential campaign kicks off. The US insists on the removal of all nuclear warheads from the country and imposition of an unlimited verification regime extending to all facilities on North Korean territory. Some sources say that Pyongyang is even urged to send away its nuclear physicists. True, it is not quite clear where the North Korean specialists will be deported. Could it be Guantanamo? There is essentially no chance that North Korea will agree to the complete and rapid elimination of its nuclear capabilities or accept a total verification regime that deprives it of any opportunity to hide a modicum of its nuclear arsenals. No matter how badly Pyongyang wants sanctions relief and economic aid, it sees security as more important. Without its nuclear shield, North Korea will be almost defenseless before the US military machine. No amount of solemn obligations and promises on Washington’s part will convince the North Koreans that they can feel safe after denuclearization. And we have not yet mentioned the potential South Korean threat. The fact remains that the peninsula is shared by the two rival Korean states. Yes, left liberal political forces favoring dialogue with Pyongyang are currently in power in Seoul. But we should not be misled by the touching scenes of Kim fraternizing with Moon at Panmunjom. There are still powerful forces in the South who do not recognize the DPRK’s legitimacy and would like to see its downfall as soon as possible. Pyongyang surely must appreciate the fact that right-wing, conservative, anti-North Korea forces could easily return to power. 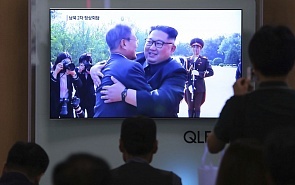 In fact, nuclear weapons are the sole equalizer that enables Pyongyang to feel confident in its dealings with Seoul and fear not a takeover by the South despite a huge gap in economic development, which it will be unable to bridge anytime soon, even if the West lifts all sanctions and North Korea has a chance to pursue economic modernization. Pyongyang may well agree to the elimination of a number of important components of its missile and nuclear program, such as the dismantling of intercontinental ballistic missiles and intermediate range missiles. North Korea can even hand over to international bodies a considerable part of its nuclear warheads and shut down a number of nuclear production facilities. To be sure, Pyongyang will demand hefty political and economic compensation for each of these concessions. Is the Trump administration ready to accept a compromise with Kim, which, though envisaging a drastic curtailment of the DPRK’s nuclear capabilities and removing the North Korean missile threat to US territory, does not mean complete denuclearization? For the time being, there is no answer to this question. Judging by all appearances, the White House has both supporters of a compromise with Pyongyang (apparently led by Secretary of State Mike Pompeo) and those who favor a maximally tough all-or-nothing approach (National Security Adviser John Bolton). Will the North Korea-US talks be influenced by Washington’s decision to withdraw from the JCPOA deal with Iran? It looks like the “Iranian precedent” does not play a decisive role for the North Koreans. They knew even before that the US could radically reverse its foreign policy position and renounce political obligations assumed by previous administrations. The DPRK has already been through this before, for example when the George W. Bush administration refused to comply with the 1994 Framework Agreement signed by the Clinton administration. Besides, the North Korean leaders are sufficiently well-versed in international politics to understand that US-Iran relationship has peculiarities rooted in the broader struggle for influence in the Middle East. The Iran crisis could even encourage the White House be more accommodating with Pyongyang in order to focus fully on the ayatollahs in Iran. To many members of Trump’s inner circle Iran is a more reviled and dangerous enemy than North Korea. Unlike North Korea that fights for elementary survival, Iran seeks to become a leading force in the Middle East and is racking up real successes. It is no secret that a powerful anti-Iranian lobby backed by Israel and Sunni monarchies of the Gulf, primarily the Saudis, has taken shape in Washington, whereas there is no institutionalized anti-DPRK lobby. Making peace with North Korea will free Washington’s hands to forcefully confront Iran in the Middle East. Do all summits lead to Six-Party Talks? There are some reasons to believe that the Kim-Trump meeting, which is likely to be joined by Moon,  will be held after all. In all likelihood it will be declared a success by all participants. It will not be much of a surprise if a Russian-North Korean summit between Vladimir Putin and Kim takes place soon, nor will a meeting between the North Korean leader and Shinzo Abe. Yet, for all of its political and symbolic importance, bilateral top-level diplomacy has serious drawbacks. One of these is that in an atmosphere of mistrust, talks on a complex international problem held strictly in a bilateral format may generate suspicions that the parties involved have a secret agenda to damage the other parties’ interests. For example, Trump was concerned that Kim’s meeting with Xi Jinping in Daliang in early May could lead the DPRK to take a tougher stand. Beijing, in turn, is certainly concerned that its strategic interests on the Korean Peninsula may prove a side note at the separate talks between Pyongyang and Washington. These mutual suspicions and innuendos could be addressed in a multilateral format, where all the more important issues are discussed jointly. At his recent meeting with Moon, Kim declared that he did not entirely trust the security guarantee that he could be offered by the US. If the guarantees come from both the United States and other powers, Pyongyang will certainly be more confident of their firmness. To provide for its security, North Korea has always relied not only on its military (and now nuclear missile) capabilities; it showed great skill in playing on differences between the great powers. Created in 2003, the Six-Party Talks format largely suited the North because, in effect, it institutionalized the mechanism of checks and balances for key powers in Northeast Asia and let Pyongyang feel more confident. It could be assumed that for this reason Pyongyang will again display an interest in reviving the Six-Party Talks in some or other form. But why the Six-Party Talks rather than a narrower four-party format involving only the North, the South, China and the US minus Russia and Japan whose influence on the Korean affairs is today comparatively limited? It is because Moscow and Tokyo have enough leverage to become spoilers, if they feel that their interests are disregarded. If the leading players really want to solve the Korean nuclear problem, there are practically no viable alternatives to multilateral talks. The stage of bilateral summits should become a prelude to a multilateral (Six-Party?) negotiating process.